My first Italian cheese selection is Bra, which comes from the town of Bra, near Turin, in Italy's Piedmont region. The town is known as the birthplace of the Slow Food Movement, founded by Carlo Petrini in 1986 as an alternative to fast food (no surprise there!). This is a movement which has expanded globally to over 130 countries. Its goals are to preserve traditional cuisine, local farming and to promote sustainable agriculture and local small businesses - in protest against the globalization of big agricultural interests. Every two years a wonderful international cheese festival is organized by the town and the Slow Food group and held in the town of Bra. It usually takes place the third weekend of September - the next festival will be September, 2011. If you happen to be in Italy around that time, it would be well worth your while to attend. 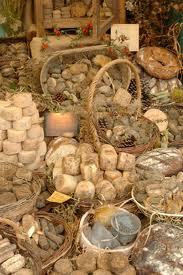 A huge variety of Italian cheese is sold from individual farmers' and cheesemakers' tents in the main square. A special event for cheese lovers! D.O.C. Bra comes in three varieties: Bra Tenero which is aged up to 6 months; Bra Duro which is aged for 1-2 years; Bra d'Alpeggio which is made only from the milk of cows that graze in the Alps from June to October (This variety is more of a handcrafted cheese with very limited production. This is one special cheese!) The best Bra is made from the raw milk of 100% grass-fed cows. While the pasteurized versions are fine, I recommend you seek out the raw milk, Farmstead versions whenever you can find them. Bra cheese is made into wheels weighing 13 to 18 lbs.. Depending on the aging period, the rind will be thin and off-white (young cheese) to hard and brownish (aged versions). The paste will range in color from off-white to dark yellow, with some small eyes. Bra Duro will be very full-flavored and pungent, whereas Bra Tenero will be quite mild, grassy and spicy. Bra - a very satisfying cheese. There are both pasteurized and raw milk versions of D.O.C. Canestrato Pugliese, a sheep's milk (pecorino) Italian cheese produced in the Apulia region in S.E. Italy. (Southern Italy is the land of sheep's milk cheeses.) But only the raw milk version has the D.O.C. designation, which requires the cheese to be made from milk taken only from Apulian Gentile or Merino sheep which graze on grass, not hay or commercial feed. It's quite a small production cheese with limited quantities available. Cordisco and the cooperative called Latteria de Santeramo both make fine raw milk examples of this cheese - so look for them in your cheese shop. The cheese is named after the reed baskets in which it is placed to drain off the whey and then to be aged (canestrato means "basketed"). The flattened drums weigh 5 to 30 lbs and can be aged from 2 months up to a year. During the aging process the cheese is rubbed with extra virgin olive oil. You will see the basket imprint on the rind which will be light brown to dark brown in color. The interior paste is straw-colored; its texture is dense and crumbly. It serves very well as a grating cheese but stands equally well on its own with a robust red wine. It is a fine example of southern Italian rustic cheeses with a pronounced, intense flavor. Canestrato Pugliese is produced from December to May when the sheep herds have been moved from the high pastures of Abruzzo down to the flatlands in Apulia. D.O.C. Fontina Val D'Aosta is not the same Fontina you may be accustomed to seeing in the supermarket! It bears no resemblance to the red plastic or wax-encased rind, plastic-tasting, fontina-type cheese marketed under the names Fontina, Fontinella or Fontella. The real, traditional, authentic Fontina Val D'Aosta is an ancient Italian cheese dating back to the 12th century or earlier. When you see the real thing today, it will be marked on its rind with a stamped label of the Matterhorn peak on the top of the rind, as well as the word Fontina. You could call it a cousin to the French Gruyère. Fontina is a versatile Italian cheese; it's used in cooking (it's known for its use in Italian fondue [fonduta]), but works equally well with meals, sandwiches, fruits and wine - or as a dessert cheese. Produced in the Valley of Aosta, bordering France, Fontina is made from the raw milk of Valdaostan cows which graze high in the Italian Alps, in a lush environment which infuses the cheese with the aroma and flavor of grasses and flowers. There is a consortium of Fontina producers (co-ops, small dairies and factories) which zealously oversees the quality of the cheese produced. The cheese is aged for 7 months in cool, humid caves. For the first 3 months of aging, each cheese is washed, salted and brushed every other day so that the rind will develop properly. It takes 5 quarts of rich milk for each pound of cheese! This is a dense cheese. In appearance the wheels weigh 19 to 40 lbs, are 12 to 18 inches in diameter and 4 inches high. The natural, crusty rind will be thin and light red-brown in color. The interior paste is straw-colored with a sprinkling of small eyes. The texture is smooth, elastic and the flavor, overall, is buttery, nutty - with a sweet finish. So special, Gorgonzola gets its own page. D.O.C. Grana Padano reminds many people of another Italian cheese - the famed Parmigiano-Reggiano. There are indeed similarities. Both cheeses are very old in origin, made in Northern Italy and originally made by monks. They are hard cheeses, made from raw cow's milk, which are aged slowly for at least 9 months, with some versions (particularly Parmigiano-Reggiano) aged a lot longer. They both belong to the Grana family (grana means grain and refers to the granular texture of the cheeses, which exhibit crags, nooks and crannies - like Thomas' English Muffins!). But Grana Padano is far more than a less expensive version of a Parmigiano- Reggiano. It stands on its own as a distinctive cheese. It's made with partially skimmed milk, whereas Parmigiano is made from a mixture of whole and skimmed milk. The flavors of the two cheeses differ because they are made in different regions in Northern Italy so the terroir (which strongly influences aroma and flavor) differs. Grana is allowed by D.O.C. 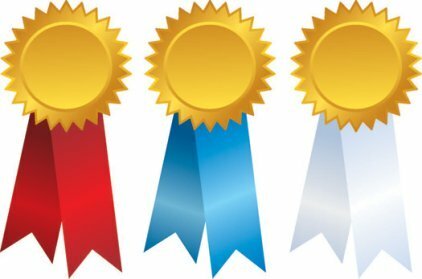 regulations to be produced in 4 regions: Emilia-Romagna, Lombardy, Piedmont and Veneto. 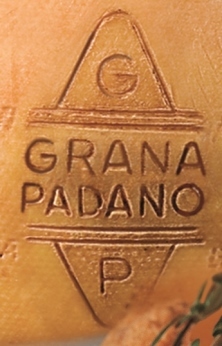 If Grana Padano passes strict quality tests of the Producer Consortium as it ages, then it is branded with its distinctive trademark of a cloverleaf around the rind. It's sold in 3 different versions depending on the aging period: Grana Padano (9-16 months) will have a texture that is still creamy, not yet very grainy; Grana Padano oltre 16 mesi (over 16 months) will have a more crumbly texture and a more pronounced taste; Grana Padano Riserva - also known as Grana Padano Stravecchio Oro del Tempo (over 20 months) is the real deal for you cheese connoisseurs - grainy, crumbly, very full-flavoured. And each Stravechio Padano will be branded with a unique serial number. You can be sure of absolutely the best quality when you see this cheese, and please do buy it. Compare it to an aged Parmigiano-Reggiano and see how you think they differ. There is no need to seek out any special producer of Grana - they are all good. Try a special recipe for Risotto a la Milanese using Grana Padano here! Many people are surprised to learn that the water buffalo is used in Italy to produce milk for the famous D.O.C. Mozzarella di Bufala Campana. They are far more common in India. Actually, no one knows exactly when, or from where, the water buffalo came to Italy. It is thought that their introduction dates back as far as the 7th century! Italian Cheese made from their milk first appeared in the 12th century and by the late 18th century, Mozzarella began to be produced in large quantities. We are all familiar with the "mozzarella cheese" used on pizza and the bland, plastic-wrapped, dreadfully tough stuff sold in supermarkets as ... "Mozzarella". There is simply NO comparison with the real stuff, which bears the trademark "Mozzarella di Bufala Campana" and the brand of the Association. This is an Italian cheese of the first order! There is a consortium of 200 producers who oversee and protect the brand, so look for the proper labeling when you buy it. It is made in southern Italy's Campania, Apulia and Lazio regions. It will ALWAYS be packaged in tubs or plastic bags of whey or salted water. This is such a fresh cheese that it simply must be consumed within a few days. In Italy, it's always consumed on the day it's made, but here in the U.S. we have to allow for the time of fast air transport. This cheese is made exclusively from whole pasteurized water buffalo milk. It's a pasta filata cheese, which refers to how it is made. The cheesemaker kneads it with his hands until a smooth shiny paste appears. He then pulls strands of the paste out and cuts them off, thus forming the individual mozzarella. This cheese comes in several sizes and shapes - from little cherry-sized balls ... to balls a little larger called "bocconcini", to large softball-sized balls and braided shapes. The pieces are then placed in brine. The cheese must not become soft and mushy. Instead, its consistency must be elastic to allow it to spring back into shape when it is pressed. The rind is very, very thin - almost nonexistent. The paste is extremely white and when you slice into the mozzarella, it should have a grainy surface. Pearls of milky whey should seep out when it is cut. And finally, it should melt in your mouth! Mozzarella di Bufala Campana is one of my favorite Italian cheeses. It begs to be eaten with fresh basil and really fresh tomato slices, drizzled with a bit of olive oil and sprinkled with fresh ground pepper. The simplest presentations are often the best, and for the best recipe for Insalata Caprese, click here. I've got 8 more phenomenal Italian cheeses to share with you. Just click here for the N to Z section on Italian cheese. And now that you are ready to rush out and try some of these wonderful Italian cheeses, you need to know which wines (preferably Italian, but not compulsory) to accompany them. Just click to be whooshed to my page on Pairing Italian Cheeses with Wine!